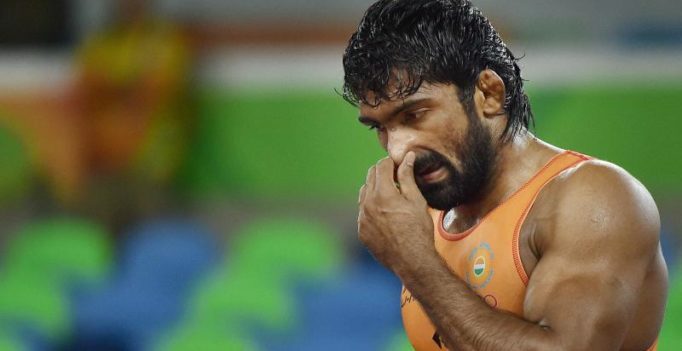 Rio de Janeiro: Celebrated wrestler Yogeshwar Dutt failed to sign off his Olympic career with a medal, losing in the opening round to Mongolian Ganzorigiina Mandakhnaran, whose quarterfinal defeat dashed the Indian’s hopes of a repechage at the Rio Games here on Sunday. Expectations were high from Yogeshwar, a London Olympics bronze-medallist, and he was touted as a strong medal prospect. But he looked a pale shadow of his previous gritty self in the 0-3 loss to Mandakhnaran in the qualification round bout. After his loss in the qualification, Yogeshwar’s only hope of making the medal round depended on his Mongolian opponent reaching the gold medal bout. However, Mandakhnaran went down 0-6 to Russia’s Soslan Lyudvikovich Ramonov, the gold medallist at the 2014 World Championship in Tashkent, in the quarterfinals to end the Indian grappler’s dream of signing off with a medal. The five-member Indian wrestling team thus finished its campaign with just a solitary bronze won by Sakshi Malik in the women’s 58kg category. The squad was originally six-strong but Narsingh Yadav was ousted after being slapped with a doping ban by the Court of Arbitration for Sports. Yogeshwar, competing in his fourth and last Olympics, hardly looked aggressive against the Mongolian, a gold-medallist from the 2010 Asian Games besides being a two-time World Championships bronze-winner. The 33-year-old grappler from Haryana, had bagged a bronze in the 60kg category at the London Games and was expected to repeat the feat in the 65kg weight division. However, from the very beginning, Yogeshwar failed to get around Mandakhnaran during his qualification bout as the Mongolian moved at a very fast pace. In the opening period, Mandakhnaran earned a point due to Yogeshwar’s passivity in 30 seconds to take a 1-0 lead. Mandakhnaran then turned a defensive position into an attacking one and successfully took down Yogeshwar to quickly bag two points and surge ahead. With a minute to go, Yogeshwar tried hard but could not get around his opponent and, as a result, went into the break 0-3 down. Yogeshwar, who qualified only in March this year for the Rio Games after struggling with a niggling knee injury, was expected to turn the tables in the second period but he simply failed to script a comeback. In the last minute of the bout, he tried very hard to get the hold of his rival and pin him down but all his efforts went in vain. The Mongolian wrestler could not earn a point either in the second period as he solely focused on defending. But in the end, the three points, which he scored in the first half, were enough for him to it make the pre-quarterfinal round. Mandakhnaran survived one more round before running into the tough Russian, who dominated the bout to march ahead.